Johan Marais's latest book is available NOW! Click on book cover pic for details & order your copy NOW! Some of Johan’s world include his humble beginnings as a snake enthusiast and small entrepreneur to the world of renown herpetologist and owner of a chain of 35 Fascination Book shops. Sadly, the chain became a victim of the current economic woes and was liquidated in October 2008. But it was not all doom and gloom – five days after the liquidation Johan and Riaana got married. In February 2009 they bought back four of the book stores as well as the Fascination brand and are up and trading again. Reading about his field research trips, one learns that not only has Johan conducted research on the reptiles and amphibians of South Africa, but his research has taken him as far a field as as Uganda, Namibia, Malawi and Mozambique where he has helped find a new species of Girdled lizard named Cordylus meculae as well as other reptiles and amphibians that still need to be described. Johan has indeed been an active contributor to reptile conservation. He is a member of the Crocodile Specialist Group of the Species Survival Commission of the International Union for the Conservation of Nature, chairman of SARCA (South African Reptile Conservation Assessment) and a member of the Herpetological Association of Africa. Together with the Avian Demography Unit of the University of Cape Town and various other herpetologists, he is involved with a four year project that aims to reassess the conservation status of all of our reptiles in Southern Africa . 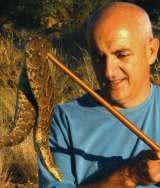 He has also authored a range of eight books, technical papers and popular articles on reptiles, both locally and abroad. Reading his profile, one discovers that Johan is a humble person and well loved by his friends and family. He has an adventurous spirit and enjoys breakfast runs on his motor bike or fishing with his friends. The objective of this web site is to communicate Johan Marais's own knowledge and experiences with this fascinating and greatly maligned group of animals. For some readers this site should help replace thier fear of snakes with respect for them. For everyone we hope to enhance their experience in future encounters with the snakes in their natural world. Appreciation for the work, time and effort Johan has put into his research, will come naturally. Also Visit: African Snake Bite Institute - A website managed by Johan Marais offering training courses in snakes, reptiles, snake handling, snake bite first aid as well as environmental impact assessmensts, reptile safaris and corporate talks. Dedicated to Promoting Understanding and Conservation of our Native Reptiles through Communication, Education and Interaction.